← Why the Daily Office? I owe a great deal of my priestly formation to Saint Benedict of Nursia. Benedict was born in a small town in central Italy to noble parents. He had all the blessings that wealthy Roman life could provide in the late fifth century, but, at the turn of that century, he realized how horrendous society was, rejected the dissolute lifestyles he saw all around him and spent three years living as a hermit in a cave by himself. Eventually, a group of monks begged him to come to their community and become their abbot, the head of a monastic community. He agreed and they regretted it. After a short period under his strict governance, the monks tried to poison him—twice actually. First, they poisoned his cup. When Benedict prayed a blessing over the chalice, it shattered. The monks likewise poisoned his bread. When he blessed the bread, a raven flew into the the room and swooped off with the poisoned bread. Let that be a lesson to you: always bless your food before you eat it! After these attempts on his life, St. Benedict returned to his cave only to be called out again by those who wanted him to become their abbot. This time his monks were more receptive and in his lifetime he established another twelve monasteries. To aid in the establishment of each monastery he composed his Rule. The Rule of St. Benedict is regarded as a spiritual classic and masterpiece of Christian asceticism. In his Rule, St. Benedict outlined the characteristics and traits of a monk, how to live humbly, how to manage a monastery, the duties of an abbot, and, perhaps most importantly, how to participate in the Divine Office. 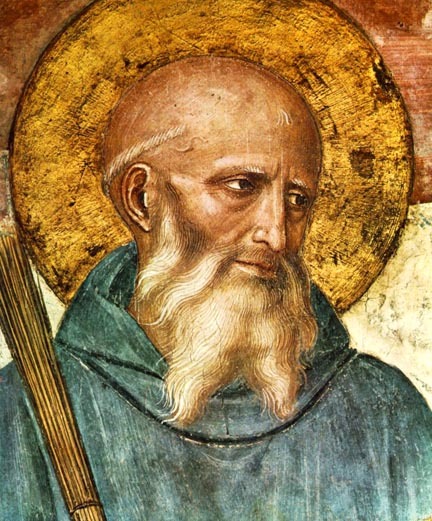 St. Benedict divided the days of the monks into work, study, and prayer. The monks prayed the various services of the day, called offices, eight times a day and read the entire Psalter (the Books of Psalms) each and every week. Click here to see the Benedictine Psalter, a chart of which Psalms they read at each of their offices during the week. In 2,000 AD, there were over twenty-five thousand active Benedictine monks, nuns, and sisters. This does not include the various Cistercian and Trappist Orders which are derived from the Benedictines. The seminary maintained its traditions quite well and the students were required to support the school. This included tuition, but more importantly came through the students own work. Decades before I matriculated, the students worked the farm, rising early in the morning to milk the cows, gather the eggs, tend the fields, and various other agricultural tasks of which I am completely ignorant. 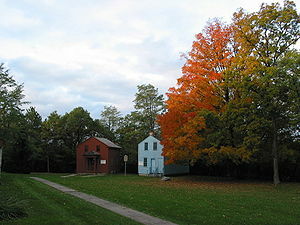 In my day, the farm was no longer maintained, but students still managed the upkeep of the school. The entire student body was divided into work crew which had the responsibility of maintaining the various buildings. This was no easy task when you consider that the campus was four hundred eleven acres consisting of around thirty different buildings. The seminary ran with twelve employees (excepting faculty and the Dean) while I was there. Remember: 30 buildings and 411 acres. Making use of student involvement was both cost effective and good for our spiritual development. I have rarely seen a Son of the House who was afraid to get his hands dirty. Most of them have a “can-do” step up and get the job done attitude. Maybe it is because of their studies in servant leadership. Maybe it is because of their hours spent in prayer and meditation in St. Mary’s Chapel. More likely, it is because they spent three years cleaning and maintaining the 411 acres of Nashotah House. In any case, whether they owe this spirit to their hours of study, prayer, or work, we have St. Benedict to thank. Almighty and everlasting God, your precepts are the wisdom of a loving Father: Give us grace, following the teaching and example of your servant Benedict, to walk with loving and willing hearts in the school of the Lord’s service; let your ears be open to our prayers; and prosper with your blessing the work of our hands; through Jesus Christ our Lord, who lives and reigns with you and the Holy Spirit, one God, for ever and ever. Amen.